Good day ! Was everyones weekend as busy as mine? We celebrated our middle sons 40th birthday. Tommorrow we will celebrate mine. Oh to be 40 again. Mind you I feel 40. We don't age do we! 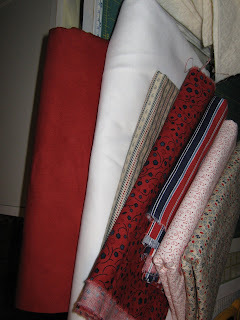 As you recall a few postings back I started a quilt called quilt as you go. 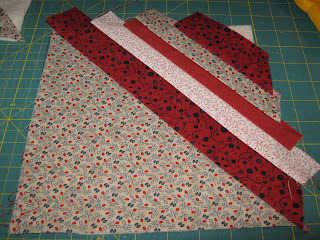 My red material is for my back and the white is for the sashings. I cut batting at 9 " and my squares to 9 1/2"
then I cut them in half. 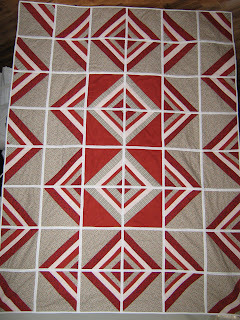 when I completed the square I cut it to 8 1/2". Well here is the finished product. 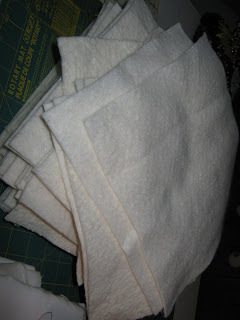 If you require the pattern just e-mail me and I would be glad to send it to you. 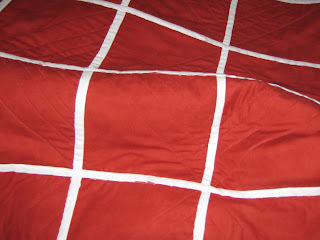 The quilt measures 51 1/2" x 68 "
Hi Linda, we are the same age and my birthday is the 19th of this month. Wow...have a great day tomorrow whatever that may be. Linda, you have two quilts in one. The red is just gorgeous! Happy Birthday Linda! Like fine wine we get better with age. Don't think of yourself as old just *vintage*. 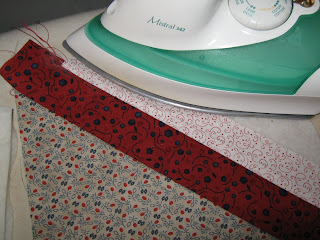 As for your quilt - wow! It looks fabulous. You must be really pleased with it. Well done.